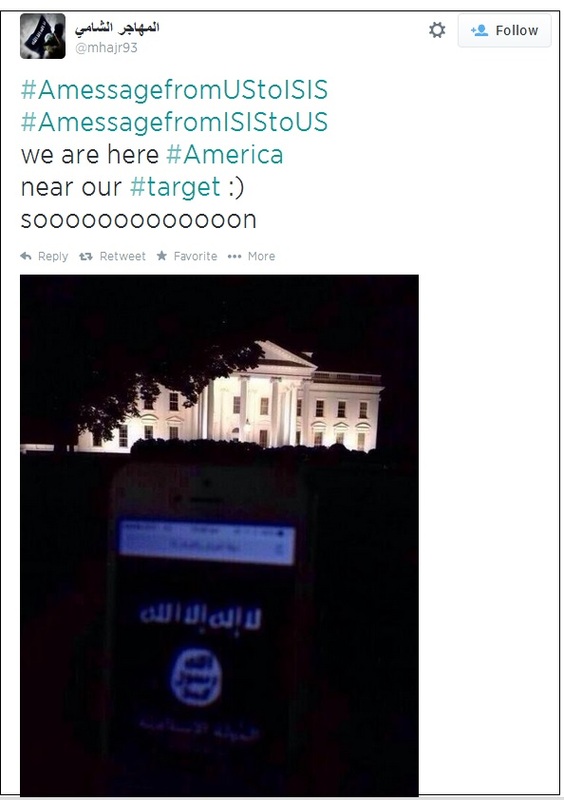 A photo posted to Twitter on Saturday by a supporter of the terrorist group the Islamic State (aka ISIS or ISIL) shows a cellphone screen with a large image of the black flag of jihad being held up so the White House is seen in the background. The Twitter account @mhajr93 posted the image. The undated photo was taken at night from the Pennsylvania Avenue side of the White House. The brightly lit North Portico is clearly seen in the background of the photo. UPDATE: What’s Obama’s Endgame in Iraq? It is not victory over ISIS. This entry was posted in Health, media and tagged Barack Obama, government, jim hoft, martha's vineyard, Obama, pajamas media, politics, rick moran, the Washington Post, vacation, white house. Bookmark the permalink.